The Colonial Williamsburg Foundation welcomes production of AMC’s hit spy drama “TURN: Washington’s Spies” to the Revolutionary City this week. Based on the book “Washington’s Spies: The Story of America’s First Spy Ring,” by historian Alexander Rose, “TURN: Washington’s Spies” attracted an average of 2 million viewers in its first season earlier this year. Production of the show’s second season starts this week, with shooting scheduled for Wednesday evening at Colonial Williamsburg’s Governor’s Palace. The show’s success coincides with growing popularity of Colonial Williamsburg’s technology-assisted alternate reality games RevQuest: Save the Revolution!, which the foundation promoted on AMC during “TURN: Washington’s Spies” first season. In the games, would-be Colonial agents tap classic spycraft to aid the cause of independence, first at home on their computers, then using their mobile devices in the Revolutionary City itself. More than 43,00o people played last year alone. 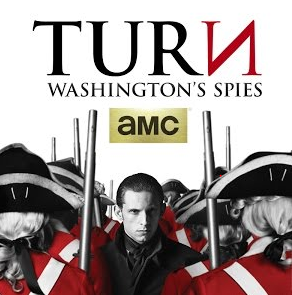 “TURN: Washington’s Spies” stars Jamie Bell as Abraham Woodhull, a farmer living in British-occupied Long Island during the Revolutionary War, who bands together with a disparate group of childhood friends to form the Culper Ring. Together they risked their lives and honor, and turned against family and King, for a fight they believed in passionately, ultimately helping George Washington turn the tide of the War in favor of the rebels. The series production in Williamsburg is also slated to include filming on the Historic Campus of the College of William & Mary, and was facilitated by the Commonwealth through the Virginia Film Office. To accommodate filming, the Governor’s Palace will close to tours at 4 p.m. Oct. 1. Ticketed evening programs will proceed as scheduled in the mansion’s advance buildings. The public is welcome to visit the Revolutionary City that evening, although scheduled production activity will not be visible from accessible areas on Scotland Street and on the Palace Green. In addition to Bell, the series also stars Seth Numrich as Ben Tallmadge, Daniel Henshall as Caleb Brewster, Heather Lind as Anna Strong, Kevin R. McNally as Judge Richard Woodhull, Meegan Warner as Mary Woodhull, Burn Gorman as Major Hewlett, Angus Macfadyen as Robert Rogers, JJ Feild as Major John André, Samuel Roukin as Captain John Simcoe and Ian Kahn as George Washington. Joining the cast for season two are Ksenia Solo as Peggy Shippen and Owain Yeoman as Benedict Arnold. Its first season was also filmed in Virginia at several locations including Richmond, Petersburg, and the Shirley and Scotchtown plantations. Other AMC series include “Mad Men,” the winner of four consecutive Emmy awards for outstanding drama series, the current back-to-back drama series winner, “Breaking Bad,” and “The Walking Dead,” the most-watched drama in basic-cable history.